Girl’s Soccer had a great KAIAC season finishing 5th in both the Conference season and Tournament. Captain Emily Birmingham was named to the All-Conference Team leading the team with 18 goals. Captain Jenny Lee was named to the All-Tournament Team leading the team in the center midfield. 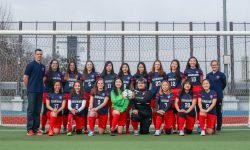 The team also traveled to Japan to participate in the Far East Tournament the girls finished 6th with Emily Birmingham and Hana Ikeda being named to the All-Tournament team. The team will be losing seniors Clara Da Silveira and Juyeon Kim who were constant examples of servant-leaders, determination, and hard work.